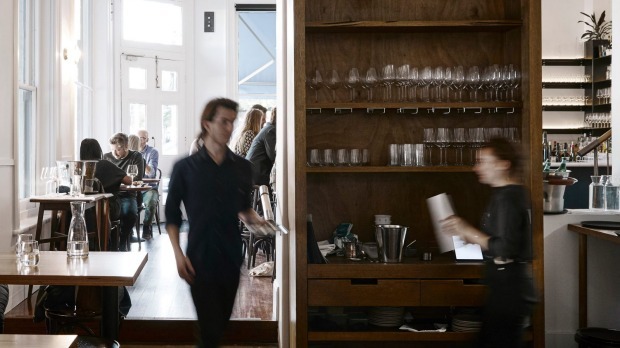 Glitch in the Matrix alert: didn't we only just visit chef John Paul Twomey at Gilson in South Yarra last July? And Carlton Wine Room right after, with chef Chris Haydon at the helm? Well spotted, eagle-eyed readers. Both restaurants were good, each with moments worthy of busting out a double thumbs up. But something magic has happened since Twomey skipped the river to helm this Drummond fave. With a fresh reno, and an all-round killer team installed, Carlton Wine Room has reopened as a force you can't ignore. On a Monday night the place is packed. Sure it's cheap movie night at Cinema Nova, but people are drinking on the street – and it's cold out. They're also stacking the new central table in the downstairs bar, whose quaint and cosy look has been retouched, retiled, uplit and generally pulled into the here and now with minimalist zing. But wait, there's upstairs too, all its paisley patterned booths and starburst wooden tables filled with the most demographically diverse crowd I've seen inside a restaurant and outside of that Australian lamb ad. It's on for young and old; rockabilly and business crew. Everyone's here. It's quickly apparent why. This is a team as tight as a drum. The manager is Andrew Joy, who was previously steering the good ship Marion. Wine-wise, Travis Howe, long-time Tonka and Coda veteran, is bringing the fun times in all shapes and carafes. Take him for a spin. We give him two separate briefs and he nails both to the wall and generally makes the name over the door resonate harder than it has since original owner-sommelier Jay Bessell left. More on that later. First things focaccia. It's back, everyone. Don't be afraid. We've learnt some lessons in lightness and not-putting-it-in-the-fridge since 1995. Here it's a potato version that's both dinner opener and star of a dish Twomey was spinning out at Gilson but has now honed to a sharp point. The hot bread, all crunch and ethereal fluff, comes with stracciatella and spring onion oil, and now basil-fresh tangles of zucchini that's the bright key to the lock. I could live without the shredded duck and pork croquettes – crumbed planks dotted with a plum relish, but only because they're just fine in a field of phwoar. Wapengo oysters are so mineral, creamy and fresh I only dip a finger in the lime dressing (it's delicious, though, if you do like tangy ballast). 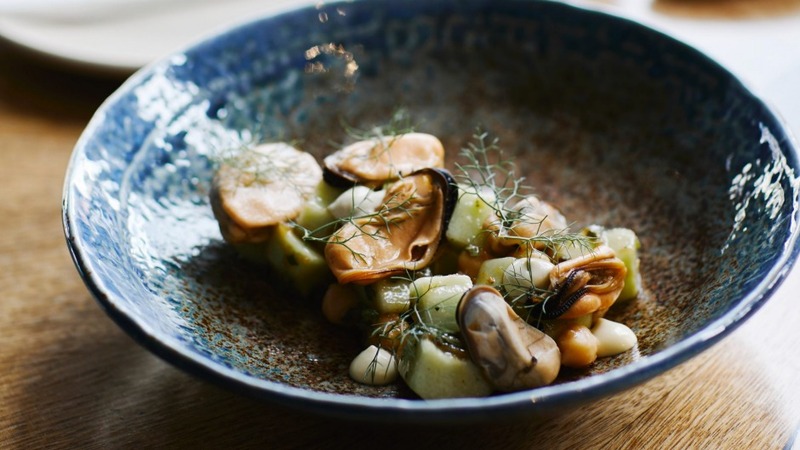 And mussels, starring in a fresh and herbal pseudo-salad of cucumber, chickpeas, dill and those chilled, fat bivalves dabbed with a sharp reduced red wine and shallot dressing and garlicky aioli. It's made better still by Howe's deft pour of a Slovenian-Austrian chardonnay-sauv blanc with serious backbone, calling to mind a ballsy Jura. It's pretty sweet, the way the wine list is set out. A symbol of a little man hugging a tree denotes the natural/biodynamic producers; the mystery glass image by the fizz (French, Australian and Italian) indicates the trending revival of the old method of opening up the flavour of sparklings by serving it in big glass. The orange points to skinsy stuff, and there's range here. My low funk brief means I max out with a 2015 Philippe Tessier romorantin that's just got an edge, while my friend goes full throttle and gets an iodine-y Dinavolino Malvasia blend that you'd need staunch chops to drink on its own, but it heels when you introduce it to some fat. Enter grilled broccolini peppered with crisp smoky lardons, a parmesan cream and a shower of cured egg yolk. That's one slutty veg dish, but it doesn't hang itself with too much fat. Ditto the bronzed, sectioned half-chook whose base of waxy potato coins and a really olive-y aioli (Twomey used the oil their olives are marinated in for extra kick) is steadied with the bitter-tang of fresh sorrel leaves. One plea to kitchens everywhere though – can I please pour my own jus rather than trying to salvage skerricks it off the plate? Who doesn't love a jug? But major props to that same kitchen for making their Monday night pasta special a big old plate of pork and veal spag bol – saucy in the right places, chewy in the noodle, finished with a good shave of ricotta salata. See also making confidently simple sides of light-dressed iceberg lettuce, and tarragon-buttered carrots. That's community spirit. That's love. (Love you can bookmark with Twomey's other Gilson import of a hot rum baba, super-soaked and mega boozy with a creme diplomat crown). 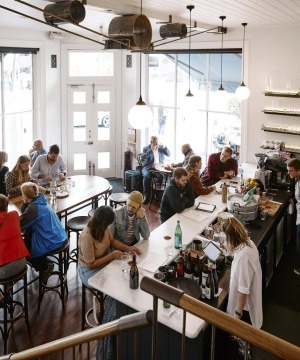 This right here is proof how one or two elements of a restaurant can be good, great even, but you need the magic service, space and food trifecta for it all to click. Everything's humming along here just that much better than it was and you can feel it. Hell, you can practically hear it. Vale the Town Mouse, but Carlton, I think everything's going to be OK. Pro Tip: Monday night is cheapo night at Cinema Nova – best date in town. 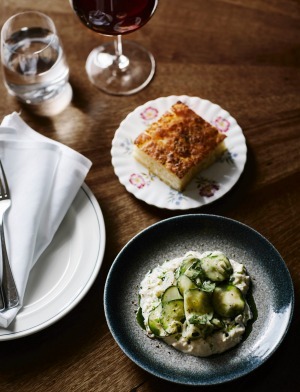 Go-to Dish: Potato focaccia and stracciatella ($14).